The BBC are reporting that Rupert Murdoch has been given the go ahead for News International's controversial takeover of BSkyB. The move is likely to inflame campaigners. The BBC are reporting that Rupert Murdoch has been given the go ahead for News International’s controversial takeover of BSkyB. The move is likely to inflame campaigners. “Murdoch has used his vast media empire to push war in Iraq, elect George W Bush, and block global action on climate change, and if he wins this week in Britain he will use his networks here to undermine all the issues that we care about. He has manipulated US, British and Australian democracy for years, but now he wants more complete control. In the US, most of the likely Republican presidential candidates are actually paid employees of Murdoch! When his Fox News Network was shunned by Barack Obama as a mere propaganda mouthpiece, it spawned the far right “tea party”and broadcast constant, often hate-filled attacks against Obama and his healthcare and peace agenda — resulting in a huge win for Republicans in the 2010 congressional elections. “Rather than worry about Rupert Murdoch owning another TV channel, what we should recognise is that he has probably done more to create variety and choice in British TV than any other single person because of his huge investment in setting up Sky TV, which, at one point, was losing several million pounds a day. So much for an impartial decision. 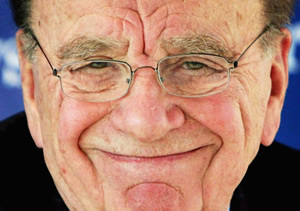 RT @leftfootfwd Campaigners ignored as Murdoch gets go ahead http://bit.ly/hXC58P <– yep, "smashing monopolies" my arse. RT @mattzarb: RT @leftfootfwd Campaigners ignored as Murdoch gets go ahead http://bit.ly/hXC58P <– yep, "smashing monopolies" my arse. Seems the goal-posts are being shifted here. Previous posts have referred to the need to maintain plurality of news provision. Without having seen the governance proposal for SN, that seems to have been at least maintained and potentially improved. Concerns have been acknowledged and addressed. The deal they’ve reached is that Murdoch will spin off sky news as an independent company, and pay it a generous subsidy to keep it afloat for a number of years. So yes, Murdoch will have the vast majority of sky, but not skynews- and that was what we were all concerned about regarding media plurality. I’m sure Hunt is far from impartial, but they seem to have come to a pretty reasonable compromise. Great to see our democracy is up and running so well. No hint of “what’s in it for me” here…Wonder if the government will now implement the Bribary Act that was passed through parliament last April, but they have so far refused to acknowledge! Bribery is a very serious allegation, is there any evidence of that here? I’d still like to see the Ofcom report. Is this Sky TV which “has probably done more to create variety and choice in British TV” the same Sky TV which fills its schedules with american imports and commisions less Uk drama than any other broadcaster (Channel 5 included)? What’s so bad about American imports? Will given that Murdoch will continue to subsidize it I cannot believe Sky News will not be subject to some sort of influence by him. The government have made an absolute mess of this. In January, Jeremy Hunt was told quite clearly by Ofcom that the bid should be referred to the Competition Commission. On 25 January Hunt said that he would be inclined to refer the bid to the Competition Commission. What’s changed that has resulted in this stitch up? Not sure it’s necesarily bribery, but Hunt needs to come out and be completely honest as to what happened and why he failed to follow Ofcom’s reckomendation. And given what Hunt has previously said, he is as much involved in this as Cable was, and so this can only be resolved by judicial review, and so I wish the media organizations campaigning against this every success. And I think Murdoch’s supporters are guilty of rank hipocricy; they attack the size of the BBC, but according to Robert Peston this deal will result in a company who’s revenues dwarf those of the BBC. At face value, this may seem a reasonable compromise. But I fear that the back door left open will allow the Murdoch empire to maintain control of Sky News and hence reinitiate concerns regarding media plurality. As I understand it News Corp will have 39.1% of Sky News, the balance of shares go to public offering. As far as I can see, there is nothing to preclude Murdoch, or his muppets, from buying up additional public offered shares of Sky News either directly or by proxy at IPO or later on. scandalousbill, as I understand it, News Corporation will need permission from the Secretary of State to buy additional shares. However, given what’s happened here, why should we have any confidence that Jeremy Hunt will stand up to Mr Murdoch if that happens? That is one of the grey areas as a purchase by proxy is not addressed. In the same light, the notion that no News Corporation employee can control Sky News by sitting on the board, selection to the management team, etc. does not preclude a simple resignation from News Corp to assume a position with Sky News or to buy additional Sky News shares directly. The devil will definitely be in the detail on this one.